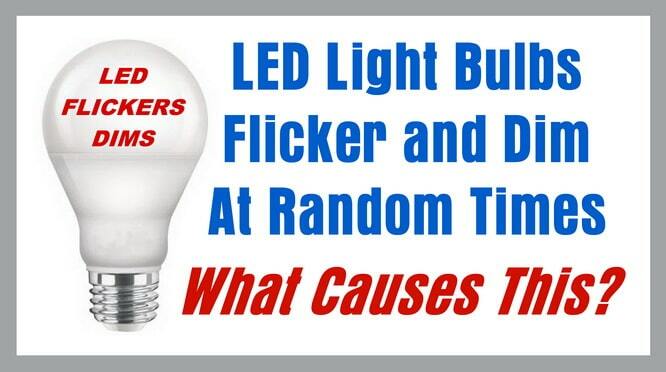 What Causes LED Light Bulbs To Flicker & Dim At Random Times? Why do LED bulbs flicker? I have recently replaced incandescent light bulbs with LED bulbs. These LED bulbs are located in the bathroom. There are 4 LED bulbs in total. The incandescent light bulbs never flickered or dimmed by themselves. It seems the LED bulbs will flicker and dim every now and then. I have the LED lights on a dimmer. The LED bulbs dim perfectly with the slider dim switch. The LED lights are brighter and more efficient but the occasional flickering is making me think there is a problem. Can you advise what I can check or do? Why do LED lights flicker and dim? LED light bulbs may flicker or dim in your home when there are voltage fluctuations in your homes wiring. There is an electrical current flowing in the homes wiring and the resistance of each wire uses some of the voltage when other things in your home are switched on and running. For example, if you run your washing machine and the clothes dryer at the same time, this is most likely why you will see an LED light dim or flicker. When electrical loads turn on and off in your home, this change in voltage levels will cause the LED lights to occasionally dim and or flicker. Certain appliances in your home require more power when they initially turn on. The name for this is “surge wattage”. When this happens there is a large drop in voltage. When surge wattage occurs, the power drain can make the LED lights dim or flicker. A solution to this is to put all appliances on separate breakers as this will lessen the surge wattage. The dimming or flickering of LED lights will probably occur no matter what. You may see slight flickering with LED bulbs no matter how your home is wired. You may have a loose connection in the circuit. Screw the LED light bulb in tighter to try and fix the problem. If heavy dust is present in the light fixtures, blow out the connection points to remove the dust. There may also be wiring at the connection point that is loose. Disconnect power to the circuit and re-tighten the wiring making sure it is tight and secure. If you have the LED bulbs on a dimmer switch, you will notice the dimming and flickering MORE if the LED lights are slightly dimmed when surge wattage happens. For example, when your central air conditioner clicks on, you will notice the LED lights dim or flicker slightly because of surge wattage. If you have the dimmer switch all the way up, you may not notice the dimming of the LED lights when surge wattage occurs. 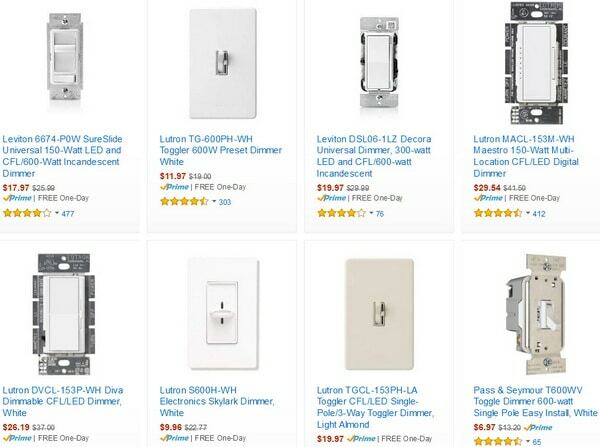 Some light switch dimmers may not be compatible with all LED lighting. Check to be sure the dimmer switch is compatible with the LED light bulbs. Some LED light bulbs are not dimmable. 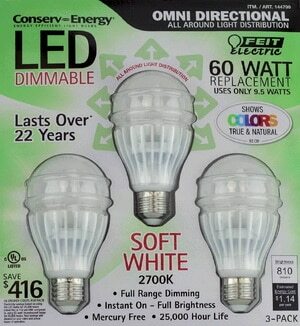 Find the LED bulb packaging and be sure it says “dimmable”. If the bulbs are not dimmable, put in a normal light switch or purchase LED bulbs that are labelled dimmable. 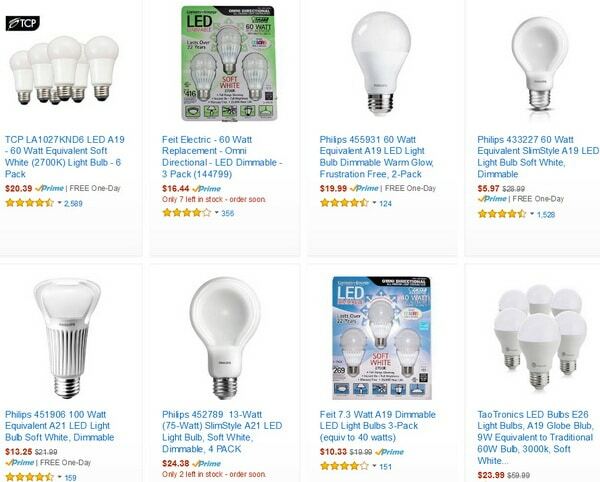 If you are using ultra cheap and low quality LED bulbs, you will notice the flickering and dimming even more. Buy high quality LED lights that are marked “dimmable” or “compatible” with all dimmer switch types. I have none of the above issues and only one bulb out of five in same lamp runs dim,then gets bright for a minute and back to dim,could there be any other reason this will happen? My lights were flickering when I put in high quality dimmables R30 LED lights. As the article stated when the dimmer switch was on high flickering seemed to stop. Then one day lights flickered non stop and then died altogether. I read about non led switches and just figured I’d buy regular dimmables lights. Just changed them all out and removed the led ones and still they do not turn on. Any ideas?